Definition: Functional Level Strategy can be defined as the day to day strategy which is formulated to assist in the execution of corporate and business level strategies. These strategies are framed as per the guidelines given by the top level management. Functional Level Strategy is concerned with operational level decision making, called tactical decisions, for various functional areas such as production, marketing, research and development, finance, personnel and so forth. As these decisions are taken within the framework of business strategy, strategists provide proper direction and suggestions to the functional level managers relating to the plans and policies to be opted by the business, for successful implementation. It assists in the overall business strategy, by providing information concerning the management of business activities. It explains the way in which functional managers should work, so as to achieve better results. Functional Strategy states what is to be done, how is to be done and when is to be done are the functional level, which ultimately acts as a guide to the functional staff. And to do so, strategies are to be divided into achievable plans and policies which work in tandem with each other. Hence, the functional managers can implement the strategy. Marketing Strategy: Marketing involves all the activities concerned with the identification of customer needs and making efforts to satisfy those needs with the product and services they require, in return for consideration. The most important part of marketing strategy is the marketing mix, which covers all the steps a firm can take to increase the demand for its product. It includes product, price, place, promotion, people, process and physical evidence. For implementing a marketing strategy, first of all, the company’s situation is analysed thoroughly by SWOT analysis. It has three main elements, i.e. planning, implementation and control. There are a number of strategic marketing techniques, such as social marketing, augmented marketing, direct marketing, person marketing, place marketing, relationship marketing, Synchro marketing, concentrated marketing, service marketing, differential marketing and demarketing. Financial Strategy: All the areas of financial management, i.e. planning, acquiring, utilizing and controlling the financial resources of the company are covered under financial strategy. This includes raising capital, creating budgets, sources and application of funds, investments to be made, assets to be acquired, working capital management, dividend payment, calculating net worth of the business and so forth. 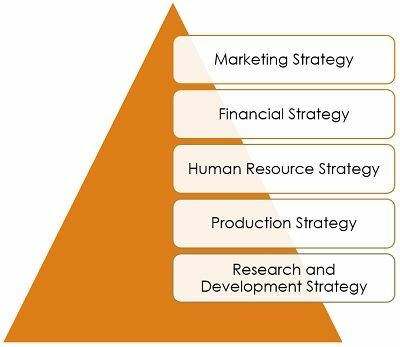 Human Resource Strategy: Human resource strategy covers how an organization works for the development of employees and provides them with the opportunities and working conditions so that they will contribute to the organization as well. This also means to select the best employee for performing a particular task or job. It strategizes all the HR activies like recruitment, development, motivation, retention of employees, and industrial relations. Production Strategy: A firm’s production strategy focuses on the overall manufacturing system, operational planning and control, logistics and supply chain management. The primary objective of production strategy is to enhance the quality, increase the quantity and reduce the overall cost of production. Research and Development Strategy: The research and development strategy focuses on innovating and developing new products and improving the old one, so as to implement an effective strategy and lead the market. Product development, concentric diversification and market penetration are such business strategies which require the introduction of new products and significant changes in the old one. To be the first company to market a new technological product. To be an innovative follower of a successful product. To be a low-cost producer of products. Functional level strategies focus on appointing specialists and combining activities within the functional area.